Law enforcement robots are becoming more common, thanks to military surplus. What do the police really want, and how will drones and cheaper robots meet their needs? On Sept. 8, 2016, members of the Los Angeles County Sheriff’s Department (LASD) found themselves in a standoff. For more than six hours, they had been trying to coax a suspect out from behind his makeshift barricade in a field. Finally, they sent in a law enforcement robots to get a better idea of what they were dealing with. Video feed showed the suspect lying on his stomach with his weapon by his feet, which the LASD saw as an opportunity. The officers distracted the suspect with their presence and the noise of a helicopter overhead. The Andros robot rolled in behind the suspect and grabbed his weapon, then rolled back out undetected. Officers were then able to apprehend the suspect without any harm coming to the officers or the suspect himself. More and more stories like this have been in the news recently, and one might wonder just how common is the use of robots in law enforcement. The worldwide market for law enforcement robots will be approximately $5.7 billion by 2022, estimated Wintergreen Research in a recent report. In “Law Enforcement Robots: Market Shares, Strategy, and Forecasts, 2016 to 2022,” Wintergreen Research said the market was just over $1 billion in 2015, with the U.S. leading in spending with 55 percent of the marketplace. Police robots are becoming more common, thanks in part to the 1033 Program, which provides for military surplus gear to be given to law enforcement agencies. However, several local authorities have been using the robots for spare parts and cite expenses. Drones and newer, cheaper law enforcement robots could change adoption rates. Officer and civilian safety are the main drivers for the use of robotics in law enforcement situations. We asked local law enforcement authorities how they are acquiring their robots, what has driven the market’s growth, and whether or not they agreed with the billion-dollar numbers. Is the 1033 Program a boon or bust for police? The Defense Logistics Agency oversees the 1033 Program, which allows law enforcement agencies to acquire excess U.S. Department of Defense property to assist in their missions to apprehend suspected criminals. Preference is given to counter-drug and counter-terrorism requests. The West Covina Police Department has certainly benefited from the 1033 Program. The small municipal department serves a population just under 108,000 and is located in Los Angeles County in Southern California. The West Covina Police Department uses a PackBot from Endeavor Robotics. 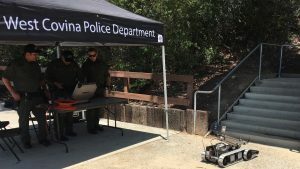 West Covina has acquired 12 robots — including two large Andros unmanned ground vehicles (UGVs) from Northrop Grumman, as well as 10 smaller PackBots from Endeavor Robotics (formerly part of iRobot) and Talons made by QinetiQ (formerly Foster-Miller) — through the program, said Sgt. Brian Daniels. Why so many robots for such a small police department? Daniels explained that not all the robots are fully functioning, and several are used for parts. The department does its own repairs on the robots and conducts training on their use. Daniels said that representatives from the robot manufacturers do come out to see him, but that the law enforcement robots he has seen are just too expensive. “Our department just doesn’t have the funding for a $250,000 robot; it’s just not going to happen,” he said. Although West Covina isn’t in a position to buy such an expensive robot, Daniels said he could envision possible future purchases of robots that fall in the $15,000-to-$20,000 range. Similarly, the LASD, the largest sheriff’s department in the world, has also acquired robots through the 1033 Program, but Capt. Scott Ewell said they are used for parts. The LASD relies on grant funding and budgeted funding for its 11 functioning robots. While Ewell said he thinks the multi-billion-dollar marketplace numbers are high, he does think many departments will find room in their budgets for direct purchases. However, Ewell agreed that prices will have to come down. He noted that departments once had to spend $300,000 on a UGV but can now get robots that perform the same functions for as little as $10,000 each. Safety is the biggest reason robots are used in law enforcement. Ewell said that authorities aren’t concerned just about the safety of their officers, but the safety of citizens and suspects as well. Their mission is to apprehend suspects so they have their days in court, he said. In addition to ground robots, the LASD uses remotely operated vehicles (ROVs) for marine situations. 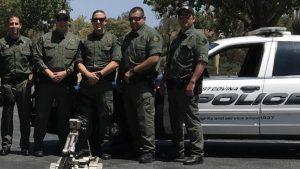 The PackBot law enforcement robot and West Covina officers. Daniels confirmed that the driving factor in deploying the robots is officer safety. He said that the West Covina PD uses its robots to go into a location and get the lay of the land ahead of the SWAT team entering. The robots can also deliver objects such as a mobile phone in a hostage situation so that the negotiation team can establish communication. Why Do Cops Need Weaponized Drones? Both Ewell and Daniels agreed that aerial drones could be the future of law enforcement robots because they are far more efficient than their UGV counterparts. Police could use drones in much the same way they use helicopters today, Daniels said. A drone could be deployed to look in windows in the case of a barricaded suspect or to pick up body heat to find a suspect hiding in a backyard. Beyond those use cases, unmanned aerial vehicles (UAVs) could be a valuable asset for the department’s public information officers, he said. A drone could be used to record a community outreach event or educational event at a school and provide video to be posted on social media. Ewell said his department responds to about 500 suspicious or unattended items per year. Currently, that response involves the blocking of a street or intersection while officers investigate. Deploying a large UGV takes a significant amount of time to unload it from a truck and maneuver it over and around obstacles to safely determine what they are dealing with. A drone could do the same task much more efficiently, Ewell said. Within minutes, a drone can be unpacked from its case and flown to the suspicious package for a closer look. It’s hard to determine if the market growth forecasted by Wintergreen Research is on point, but local agencies are increasingly likely to use law enforcement robots in their day-to-day operations. 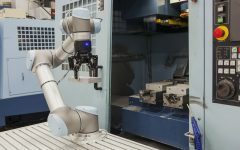 As prices continue to come down and robots become easier to use, smaller jurisdictions such as West Covina won’t have to rely on the 1033 Program and will be able to buy direct from manufacturers. “Robot technology, in general, is the wave of the future for law enforcement. It makes things safer for everyone involved including the criminals themselves,” said Ewell. Traci Browne is a freelance writer specializing in robotics and manufacturing. Her work has been featured in various trade publications and industry magazines. In addition to writing under her own byline, Browne also works as a corporate ghostwriter.